Wondering how to make cranberry sauce? It couldn’t be any easier! You just need cranberries, orange juice and zest and a sweetener. 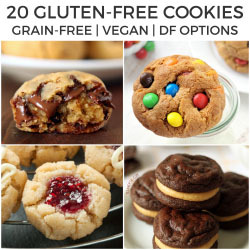 Can easily be made vegan and paleo! For a how-to recipe video, scroll to the bottom of the post. I already have a recipe for cranberry orange sauce that’s honey-sweetened but I wanted to share a vegan cranberry sauce recipe for today. The only difference between the two cranberry sauce recipes is the sweetener. Instead of honey, you can use maple syrup for a naturally sweetened paleo cranberry sauce or granulated sugar for a non-paleo version. I also thought I’d try out this cranberry sauce with cinnamon and it’s also really, really good! But I still think I prefer the orange version. 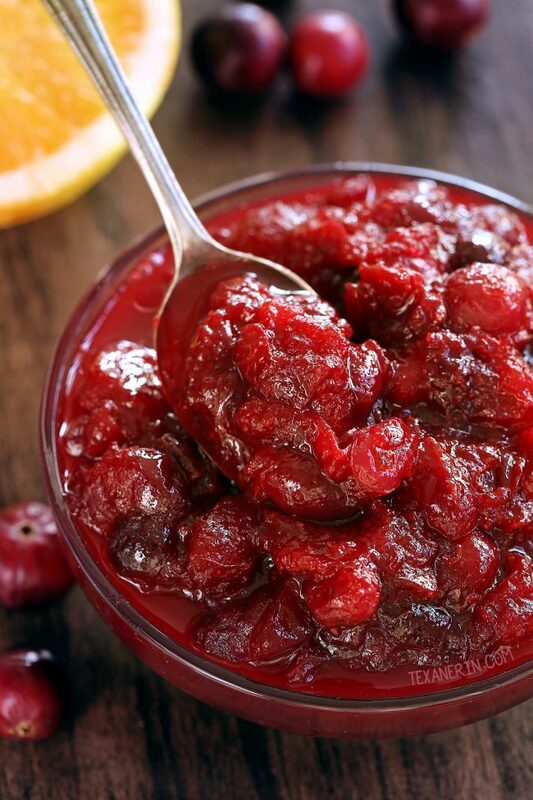 If you’ve never had homemade cranberry sauce before, you’re in for a treat! This is nothing like the canned stuff. I’ve always passed on that stuff. I’d much rather have saved room for dessert, like my maple cheesecakes, pumpkin cupcakes, or caramel apple cake. So how to make cranberry sauce. It’s way easier than you’d think. You just mix together a few ingredients and simmer for 10-15 minutes. Just don’t forget about it on the stove and you can’t mess it up! Homemade cranberry sauce is the perfect task for those family members who don’t know how to cook or bake but still want to participate in the Thanksgiving preparation! 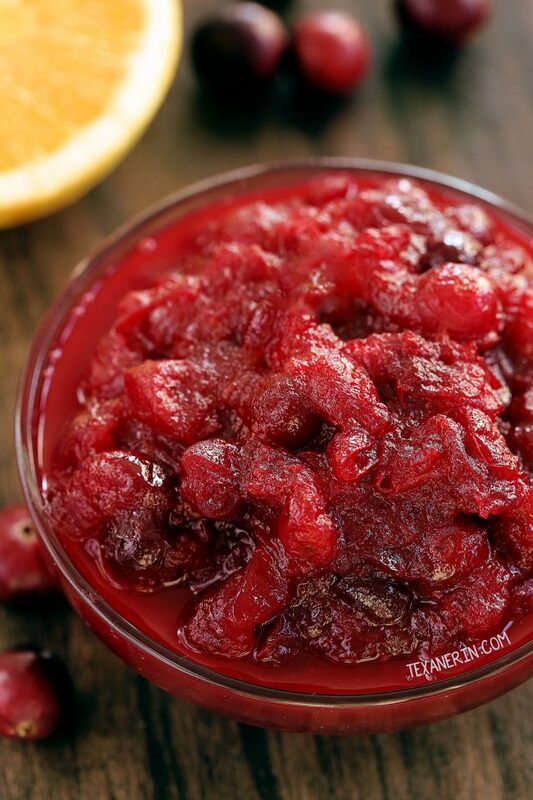 If you want something a little different, try this cranberry pomegranate sauce! This gluten-free gravy would also be a great option to delegate! So with just a few days left before Thanksgiving – are you ready? We haven’t done a darn thing. With a 1-week-old at home, we don’t even know if we’re going to do Thanksgiving! It’s so much effort for two people. I might just make these gluten-free apple crumbles for two and call it a day. Looking for some other easy Thanksgiving sides recipes? Try my gluten-free cornbread (which can also be made with all-purpose flour!) or soft and fluffy whole wheat dinner rolls. And for dessert? I have loads of options! Some of my favorites are these pumpkin pie bars, which have an easy and simple streusel crust and topping and these mini pumpkin cheesecakes! Click below to view the how to make cranberry sauce video! Over medium heat, mix together the sweetener, orange juice. and orange zest and / or cinnamon. Add the cranberries and cook, uncovered, until most of the berries have popped and the sauce has thickened a bit (it'll continue to thicken as it cools, which takes about 15-20 minutes). It takes about 10 – 15 minutes of simmering. I don't bother stirring, but you can if you like. Taste the sauce and add more cinnamon, if desired. Pour the cooled sauce into an airtight container and store in the refrigerator for up to 5 days. For paleo, make sure to use honey or maple syrup. 18 comments on “How to Make Cranberry Sauce” — Add one! Thanks for sharing the recipe, I really like and would love to try it .. It was so wonderful to hear you have a new born baby! God bless you all! I’m going to make this for sure and I will probably use agave syrup just because I have it on hand. I tell all who eat anything I bring to work to check out your delicious and healthy recipes. I just made my Mother’s raw apple cake in the beautiful Nordic Ware bunt I purchased because I saw it here! Hi Heather! Thanks a bunch. :) I hope you’ll enjoy the sauce and thank you so much for telling your co-workers about my recipes! And it’s great to hear that you found a nice, new pan through one of my posts. :) Thanks again for your thoughtful comment! wow..! these looks so yummy & perfect, i will trying to making this sauce, Thanks for sharing…! Hi Christine! Thanks so much! I actually intended on making a proper announcement but this post was accidentally published (and had wrong info in it). But the baby has arrived! We’re both doing well. :) Thanks again! Cranberry sauce is my favorite holiday side dish! I could eat it every day! I am going to have to try this out this year! I’m wondering why we only eat cranberry sauce during the holidays!! I say we eat it all year long!! This sounds delicious! I made your orange cranberry sauce last year and we loved it. I have never eaten cranberry sauce because it just never looked good to me (the canned jellied stuff). Ha! Dean loved it on a turkey and pepper jack cheese panini also. I hope you are not still waiting???? We actually got home from the hospital yesterday! 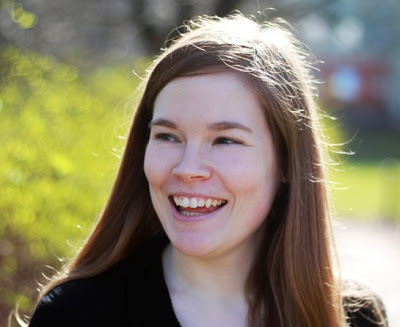 I mentioned having a 1-week old baby at home in this post but I actually wrote this post in advance and then it accidentally got published and confused some people. Sorry about that! I’m so happy you enjoyed it! The canned stuff is definitely not the best. ;) And yum, that panini sounds delicious! I’ve never actually made cranberry sauce from scratch! This looks absolutely perfect! Yummy! Loving the flavor combination of the cranberry and orange! They compliment each other so well. I’m ditching the can version and trying this out next week! I’m sure my family will be pleasantly surprised.